The Rollright Stones were a short-lived but successful folk song and dance band. 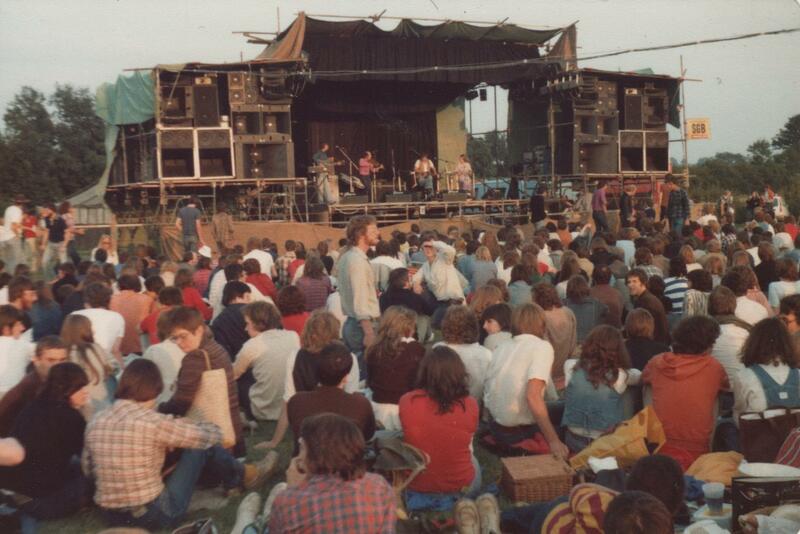 We were based in Banbury and gigged between 1978 and 1980. Adderbury Village morris dancer Bryan Sheppard played concertina and melodeon, and was also our caller for our dance (ceilidh) gigs. Bryan also did some solo morris jigs as part of our act. The Bacca Pipes Jig involved Bryan dancing over and around a pair of old-fashioned clay pipes. Full of bravado, Bryan would offer to buy the whole audience a drink if he made a mistake whilst dancing, and broke the fragile pipes. Of course, the pipes were not fragile at all. I made them from coathanger wire, wood and a lot of filler. Chris (Christine) Sheppard (Bryan's then wife) was on vocals and percussion, and also did some clog dancing. We made up an amplified clogboard for her (by fixing a contact mic to the bottom of a wooden platform). Chris is dancing on this in the photo on the left. Pete Kenna (like me, ex-The Worcester Brawles, played guitar, glockenspiel, and accordian. I played fiddle, flute, recorder, and other instruments, and sang too. We had a few friends as guest musicians from time to time, too. One of these was fellow fiddler Chris Leslie (nowadays, a member of Fairport Convention) who played bass for us once or twice at dance gigs. 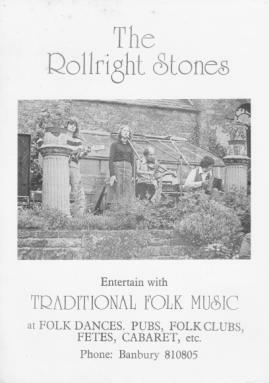 The Rollright Stones started by doing floor spots at Banbury Folk Club and grew rapidly from there. In the short time that the group existed, we did lots of gigs, of all kinds. Some gigs were unforgettably hard work, like one bitingly cold outdoor set at Moulton near Northants. Other gigs were better forgotten: at a Sports and Social Club in Bicester, the audience had left completely by our second or third song, but rushed back in and began dancing once we were paid off by the organiser and the juke box restarted. 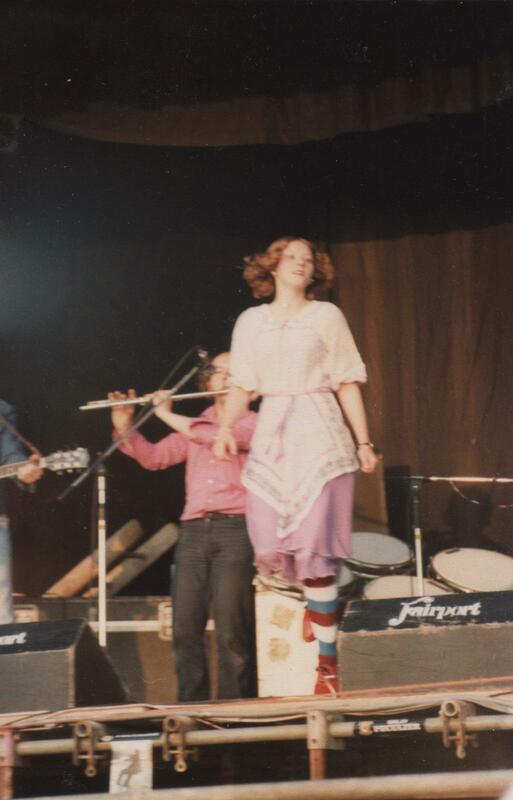 Most, however, were a lot of fun, like The Lacock and Chippenham Folk Festival in May 1979. 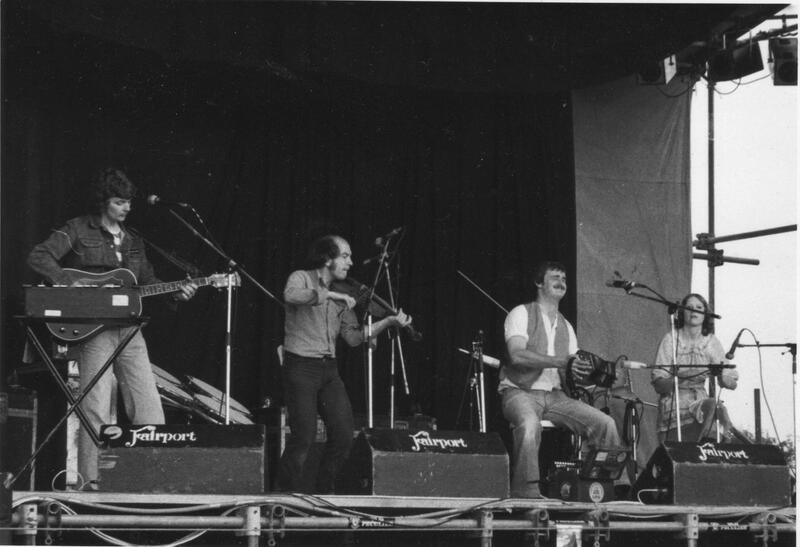 Also fun (if nerve-racking at the time) was supporting Fairport Convention at Banbury's now-vanished Winter Gardens (it had a bar named The Inn Within which was a real haunt for the local hardened drinkers). We also really enjoyed the gigs we did in Belgium, first at the Poechenelle bar in Brussels then elsewhere. Following one of these Poechenelle gigs, Brian got so drunk that he climbed in underneath (rather than above) the rubber sheets which were on all the beds in our rather unsalubrious Brussels hotel. Yuk! 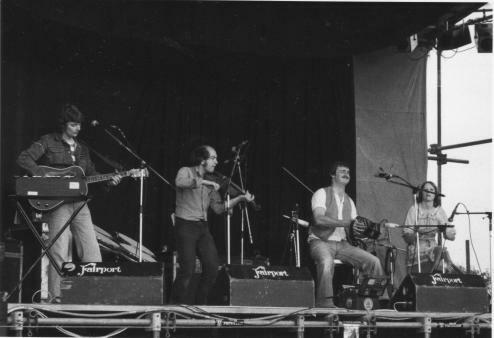 When The Rollright Stones played at Fairport's Farewell Concert at Cropredy, Oxfordshire, in August 1979, it was meant to be Fairport's final gig: however they subsequently reformed. We got very nice reviews. Folk Roots described The Rollrights as "... a really dazzling little folk group who were the first bright spark of the afternoon, with a programme that was varied, in content as well as dynamics, and representative of the best that the folk scene has to offer at a grassroots level...". Melody Maker reported that "... a group called the Rollright Stones brought the crowd to its feet with some lively concertina-based music". Things were looking good, but we split up not long afterward. Bryan went off to The Hookey Band. Pete and me continued as a duo, calling ourselves The Rollrights (we had become fed up with jokes from comperes along the lines of "... not the Rolling Stones, but the Rollright Stones"). Pete and I did more Belgian gigs in November 1981, this time we traversed the country. At one gig, we were told we could sleep in the bar where we'd been playing, and (once it had closed) help ourselves to any drinks or snacks which took our fancy. So we did this, not unwillingly. I remember that we worked our way through a very wide range of alcoholic beverages. During which Pete accidentally ate a pepperami snack with the plastic wrapper still on it. I work the next morning with a headache beyond all headaches. One of the experiments which we tried at that time was playing folk dances with a drum machine. The technology was still pretty primitive, but taught me a few things which came in handy years later, with Tricks Upon Travellers.